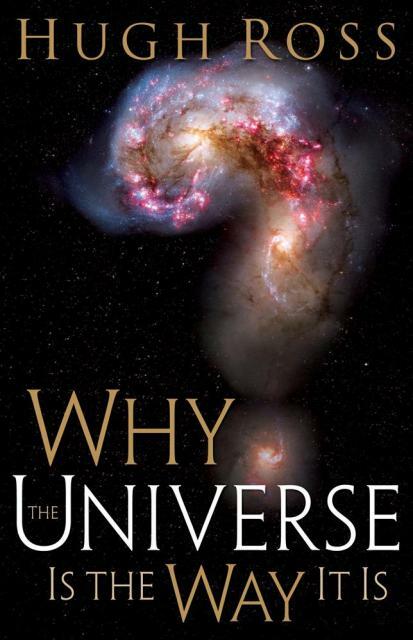 Why The Universe Is The Way It Is, (hardcover, Kindle) was written by astronomer Dr. Hugh Ross (Reasons to Believe) a few years ago to address several common questions that he receives from atheists and Christians when he presents his case for the existence of God. The book is 240 pages, divided into thirteen chapters, five appendices, and an index. Dr. Ross recorded a podcast describing the material of each chapter. A link will be provided at the end of each chapter's summary of this review. Dr. Ross also has a lecture and a Q&A session on YouTube. Why The Universe Is The Way It Is from RTB: MEDIA on Vimeo. Chapter 1: Why Ask Questions? Dr. Ross begins this book by exploring the reasons that people ask "why" questions. He makes the distinction between "how" questions and "why" questions- the first being a curiosity of function and the second being a curiosity of purpose and meaning. He discusses his early childhood curiosity about the function of the cosmos that led him to test the accuracy of the world's religious texts. His investigation caused him to conclude that the Bible was inspired by God, which led him to be able to answer his questions of meaning and purpose. Dr. Ross then provides a quick outline of the rest of the book and how it will use science to help the reader discover answers to often-asked "why" questions. Chapter 2: Why Such A Vast Universe? Recently, the enormous size of the universe has been used as an argument against an intelligent designer. The argument observes the vastness and posits that there is no purpose for the universe's size; therefore, it concludes, that the "designer" is extremely wasteful or the universe wasn't designed at all. Dr. Ross explains the power of the challenge by showing the reader the sheer size of the universe through scaled comparisons. He emphasizes the size of earth compared to the universe to demonstrate that the challenge is saying just how wasteful the designer is if humanity was its goal. Dr. Ross then addresses the challenge by showing how the size of the universe is necessary for humans to discover it. In that ability to discover the universe, humans have been able to measure the fine tuning of the mass density, dark matter, and dark energy (the universe's expansion rate) for life to exist to discover the these attributes of the universe. 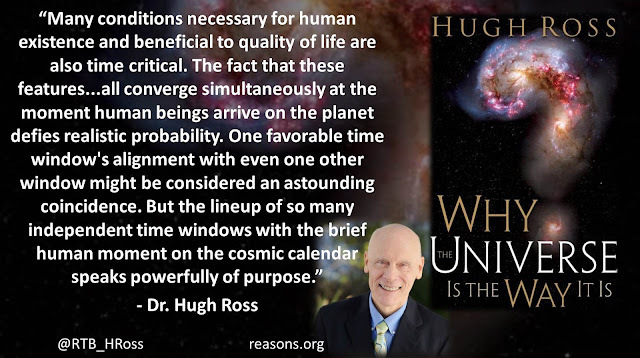 Dr. Ross concludes that not only is the universe fine-tuned for human life, but for those beings to discover the design in the universe- and perhaps draw conclusions about and become more curious to know its Creator. Podcast: Why Is The Universe So Vast? Chapter 3: Why Such An Old Universe? It has often been challenged that if God created the universe, then its age seems to be entirely too old. Similar to the challenge addressed in Chapter 2, this one also concludes that God has wasted resources (time) or the universe doesn't have a designer. In the third chapter Dr. Ross explores several reasons, given the laws of physics the universe exhibits, for the old age of the universe. He believes that since humanity is the crown of God's creation, then the age of the universe must revolve around preparing a place for humanity to live. Ross explains several different conditions that must be just right in the universe and on earth for humanity to have a place to live. He makes the point that rather than waiting for more time to pass to bring humanity into the world, God created humanity at the earliest possible time that the universe and earth were able to provide a home for humanity. From that perspective it provides powerful evidence that the universe is ironically incredibly young when compared to naturalistic possibilities. He also shows that the time window for humanity to exist and be able to explore the universe (and discover its design) is incredibly small compared to the age of the universe. He argues that the facts that humanity appeared as early as physically possible AND within the time window to discover the universe are both powerful evidence that the creation of the universe and of humanity were designed by a Being outside of space and time Who has a specific purpose for humanity. Podcast: Why Is The Universe So Old? Chapter 4: Why Such A Lonely Universe? Many people grant that we are alone in the universe (no alien life), while others insist that we will find extraterrestrial life eventually. In Chapter 4 Dr. Ross looks at how aliens could not have visited our planet and how it is possible that earth is the only suitable planet for intelligent life anyway. He explains several challenges of interstellar travel for advanced life- the cosmic speed limit and the vast distances (resulting in multi-generational time spans), the psychological effects of confinement and physical limits of trying to maintain a stable ecosystem over time. He concludes that due to those challenges alone, if aliens do exist, they would not be able to travel to earth. He then shifts focus to the assumption of his first response: that aliens can exist. He explains several factors about earth that make it uniquely suitable for intelligent life among the other planets in the universe. He points out the necessity of several factors including the solar system (specific number, sizes, types, distances, and orbits of other planets), the position of earth relative to the sun, the positioning of the solar system in and the type of the galaxy, the position of the galaxy in the cluster, the size and density of and the location in the cluster, and the location in the super-cluster. He concludes that since it seems so likely that humans are the only intelligent life in the universe, that God must have a specific purpose for humanity. Podcast: Why Such A Lonely Universe? Dr. Ross co-authored a book dedicated to UFOs, aliens, and extra-terrestrial life called "Lights In The Sky and Little Green Men". If you're interested in more than merely a chapter-length treatment of this topic, it is definitely worth checking out. Chapter 5: Why Such A Dark Universe? After discussing the features of the universe that are necessary for advanced life and demonstrating that life-habitable space is quite rare, Dr. Ross turns his attention to the fact that the space is vast enough to allow for further fine-tuning for purposes other than just the origin of advanced life. He points out that of the space that is available in the life-habitable zone of our solar system, our planet resides in the darkest habitable part of it. Likewise, our solar system resides in the darkest habitable part of the galaxy, and the galaxy resides in the darkest habitable part of the galaxy cluster. Dr. Ross explains that these factors along with our dark moon, dark planets, and distances from other sources of light are additional fine-tuned factors that don't really affect the habitability of life. Rather they affect the discoverability of the universe and its other finely tuned features. Dr. Ross explains that if a personal God created the universe and wanted to be discovered, He would not only fine-tune the universe for life, but also fine-tune it so His creatures could discover the unmistakable hallmarks of design in the universe and understand that it is the product of a Designer. Just any location in the habitable zone would not allow for the universe and its features to be seen. It takes a finely tuned location within the finely tuned habitable zone to even discover that such a habitable zone exists. Podcast: Why Such A Dark Universe? Chapter 6: Why A Decaying Universe? In Chapter 6 Dr. Ross turns to the question of why decay is necessary. He begins by explaining that life's existence is dependent upon decay. But he spends the majority of the chapter showing how the decay that makes life possible will also lead to the inevitable extinguishment of all life. He appeals to work by atheist Lawrence Krauss to show that the laws of physics will lead to what is called the "heat death" of the universe- the time when all heat transfer will cease, and all work and life are impossible. 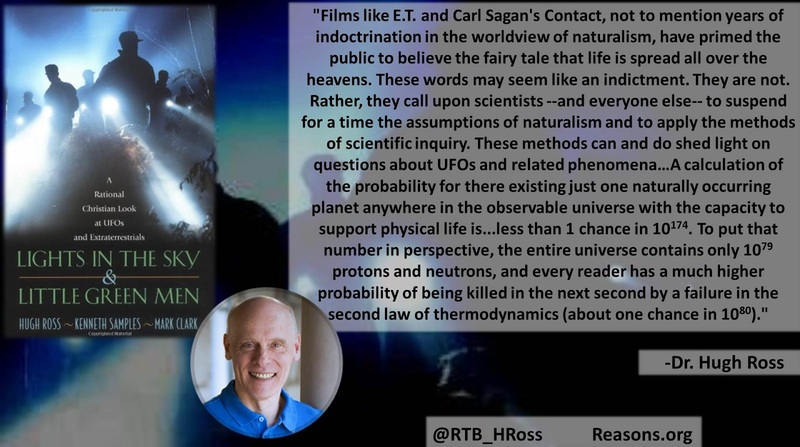 Dr. Ross points to several implications of such a reality including loss of the universe's observability, knowledge, consciousness, and meaning. He then lists four published affirmations by the Council for Secular Humanism that Krauss' work falsifies. 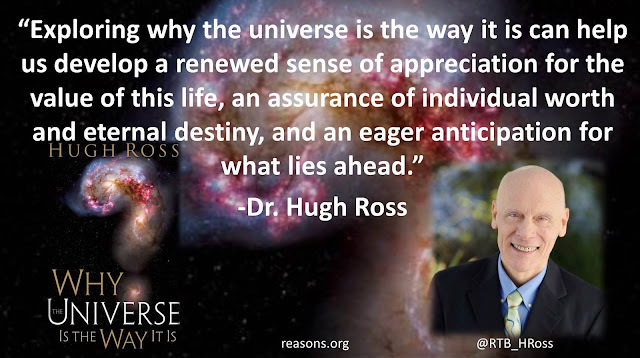 Dr. Ross shows that if the universe that we live in is all that there is, then all hope is gone and decay has no ultimate purpose. However, he concludes if hope does exist, then it and the further purpose for decay must involve a realm outside our universe, which is exactly what Christianity posits. Podcast: What's So Good About A Decaying Universe? Chapter 7: Why A Realm Beyond This One? The Christian worldview teaches that this universe is not our final destination. If Christianity is the correct worldview, then the universe should exhibit a reason for the necessity of another realm. In Chapter 7 Dr. Ross shows that the fine-tuning of the spacial location of earth in the universe is not enough for human life to originate and thrive. He shows how several narrow time windows must overlap each other along with the spacial fine-tuning of the location in the universe for human life to exist. Among others he appeals to narrow range of time that earth's rotation rate, fossil fuel development and storage, the sun's stability and luminosity, and plate tectonics all support human life simultaneously. He explains that this time window will come to an end, but observes that all life has the drive for survival- and humans the drive to live beyond what is even possible with the physical conditions. Dr. Ross explains that another realm is necessary for such a drive to be fulfilled, because this universe physically cannot fulfill it. Podcast: Is There A Realm Beyond This One? Chapter 8: Why This Particular Planet, Star, Galaxy, and Universe? Chapter 8 serves as a segway chapter. Dr. Ross brings together the information from the previous chapters into hard numbers. He puts forth a way to test his hypothesis about the universe being designed for human life and shows how the data clearly demonstrates that a Designer is the only reasonable explanation. He also addresses the attempts to avoid his conclusion by positing the multiverse. Since he has concluded that the data support the idea that the universe was created for humanity, he further concludes that humans have ultimate purposes, which is the discussion for the remainder of the book. Podcast: What Is The Anthropic Principle? Chapter 9: Why Believe The Bible? In order to discover what humanity's ultimate purpose is, a reliable source that makes claims for humanity's purpose must be identified. Dr. Ross provides several scientific reasons that the Bible is a reliable source for such information. He demonstrates that the Bible explains where the universe came from, the features of the universe, earth's features, life's history, the roles of advanced animals, and what make humans different from all other creatures. Of course much similar information could be included in any text; however, Dr. Ross points out that the Bible contains information about each of these that people at the time did not know, had contrary beliefs about, and could only be discovered by a Source outside the universe. He explains that the Bible describes features of the universe that would not be discovered by humans until millennia later. Having such predictive power indicates a supernatural Source. Due to the uniqueness and accuracy of the Bible in its content (which could not be produced by merely human minds), Dr. Ross concludes that the Bible is a reliable source for knowledge about the Creator and humanity. Podcast: Can The Bible Be Trusted? Chapter 10: Why Not A Perfect Universe Now? In the tenth chapter Dr. Ross addresses reasons why God did not create a "perfect" universe- one that includes pain and suffering. He points out that the laws of physics that result in much pain and suffering are (as discussed in previous chapters) necessary for physical life. However, he does not leave it at that. Dr. Ross connects the teleological argument for God's existence to the answer to the challenge of pain and suffering in the world. To do this he appeals to scripture and theology. He lists and describes eleven unique yet connected purposes that God has for allowing pain and suffering in the world. By doing this, Dr. Ross shows that this universe is perfect for God to accomplish His multiple purposes that He revealed to man through special revelation. Podcast: Why Not A Perfect Universe Now? Chapter 11: Why These Physical Laws And Dimensions? Related to the question of a "perfect" universe is the question of why God created the universe with the laws of physics and dimensions that allow for so much pain and suffering (surely, that is not compatible with an omnibenevolent and omnipotent God). Dr. Ross focuses on this challenge by pointing to how the laws of physics are designed to deliver consequences for sinful behavior. He explains that the laws of physics ensure that natural consequences cannot be escaped, including consequences that affect others. He offers that this is a powerful deterrent for many to commit evil acts. He then explains that the physical dimensions and the fact that time is linear and is unstoppable and irreversible put a limit on the amount of evil that any one individual may perform. Not only was the universe designed to address evil acts, but it was designed to keep evil actions in check, while God performed His ultimate goal of overcoming evil through Jesus Christ's life, death, and resurrection. He concludes that a since this universe is designed to deal with evil, and evil will be overcome, then another creation must exist for those who accept Christ's sacrifice to spend eternity with their Creator and Savior free from evil. Podcast: Why Does The Universe Exhibit The Laws That It Does? Chapter 12: Why Two Creations? Sometimes people will ask why God didn't make this universe perfect to begin with- why must there be two creations? Dr. Ross begins to answer this question by observing that Christianity is unique among the world religions in its description of where humans will spend eternity. He explains that other worldviews describe this realm in ways that are comprehensible to humans, while the Bible describes it in ways man cannot possible comprehend (evidence that it is not part of this universe and that its Creator is the source of the revelation of that information). Dr. Ross then moves to Adam's and Eve's fall into sin- showing that the presence of free will and temptation leads to a fall into sin. In the second creation, no sin or evil exists, yet free will is still just as present as it is in this universe. He concludes that it is because of the testing and quickening of our hearts and minds to be like Christ in this creation, that the next will be perfect. Thus, this creation is the best world to get to the best possible world. The current world must exist in order for no sin or evil to coexist with creatures that are free. However, Dr. Ross makes clear that this will not take place for every human. Since we have free will, it does take an act of the will to decide to allow the Holy Spirit to work in us- by consciously accepting the fact of our sinfulness and accepting Christ's atonement for our sin. Podcast: Is Christianity A Two-Creation Model? Chapter 13: Why Is The New Creation Better? In the final chapter Dr. Ross looks at what scripture records about the new creation. He takes that information to infer several features of the new creation. These include radically different or a complete absence of the laws of physics as we know them- the second law of thermodynamics, electromagnetism, gravity, mass, and time. He explains the dramatic advantages of having different laws or the absence of the limitations altogether for our relationships with people (and God) and abilities to learn, play, work, and rest. He also reminds the reader that the apostle Paul made it very clear that no mind has conceived of what God has planned for us. With that, Dr. Ross explains that the incredible experiences that our minds can conceive with the information that has been given in scripture and can be further inferred from it is only a mere glimpse. Our minds have conceived of an awesome place, yet no mind can conceive what God has planned. Dr. Ross concludes his book by explaining that God's plan for humanity is an incredible gift, but it will not be forced on anyone- they must freely choose to come humbly to Christ and surrender their life to Him. Podcast: What Can We Know About The New Creation? Why The Universe Is The Way It Is was a fascinating book that this reviewer did not want to stop reading. 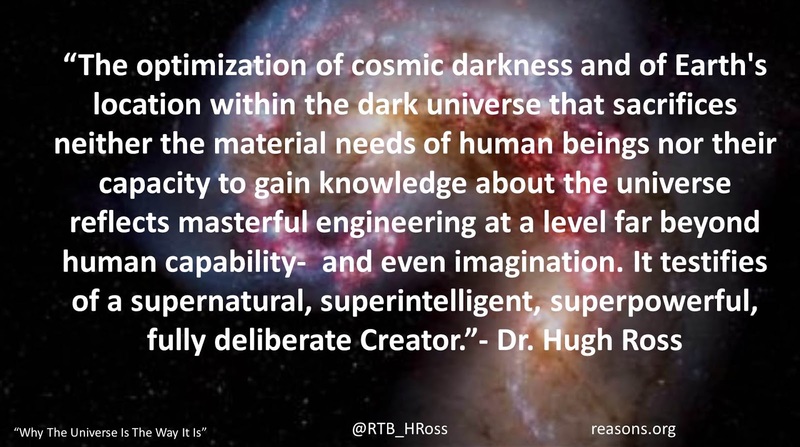 Dr. Ross explains in powerful terms just how compelling the evidence is for God's existence from our study of this creation. He masterfully lays out the teleological argument, but in the process he also provides an answer to the problem of evil. It is written in such a way that will grasp the attention of both lay person and academic, believer and unbeliever. If any person is interested in how the design argument can be used to answer the challenge of evil, they need to get this book. Dr. Ross has since written a "sequel" to this book call "Improbable Planet: How Earth Became Humanity's Home" that argues from the delicate design of the history of our planet that it was designed for the purpose of Redemption through Christ.